Greenway Dumpsters offers outstanding commitment and promise in providing environmental solutions while getting the job done. Our team of professionals provides a fully integrated range of dumpster rental services within the solid waste industry, including collection, transfer, disposal, and recycling for businesses, and residents. From our customer service staff to our dedicated drivers, our goal is to ensure that you have the most efficient, economical, and environmentally dumpster rental services for your waste needs. We offer professional commercial and residential delivery. Have access to dumpsters that can assist with special events, new construction, and organized projects. These popular hook-lift containers are top quality in the industry and delivery is timely within 24 hours at a flat fee. 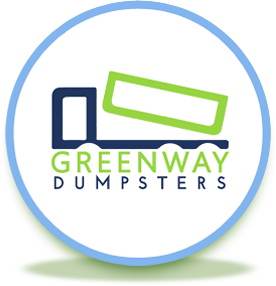 Residential dumpster rental services extend through individual homeowner, homeowners’ association, municipality or an apartment building owner, Greenway Dumpsters has an environmentally accountable and low-cost waste solution for you. Customer satisfaction is top priority for dumpster retrieval. Our within 24 hr dumpster rental service pick-up is on time and for your convenience. Let our fast pick-up service dispose of debris and help you with any extra removal. We know the aftermath of scattered debris can be unattractive and messy. Our clean-up removal goes the extra mile to make sure your driveway is swept and cleaned to ensure that no mess is left behind. Have questions about what you can and cannot recycle? Call us!